The United States Ambassador to the United Nations, Susan Rice, identified Kashmir as one of the world’s hot spots and bracketed it with contested regions such as the Balkans and Golan Heights during her testimony before the Senate Foreign Relations committee last month. Likewise, in an interview with Time magazine in November 2008, President Barack Obama stated that “working with Pakistan and India to try to resolve the Kashmir crisis in a serious way” was one of the most “critical tasks” for his administration. For the most part, Kashmir maintained a sense of communal harmony throughout the war in 1948, following Pakistan’s independence from British India in 1947. And although the Kashmiri region of Jammu was witness to the worst kind of massacre and exodus of Muslims to the neighboring areas of Pakistani-ruled Punjab during the war, this did not affect the daily life of most Kashmiris outside Jammu. 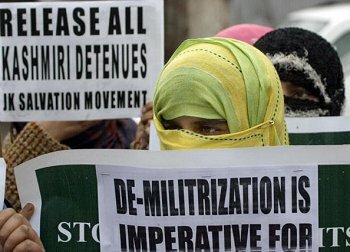 While the roots of the present conflict trace back to the time of partition, the more recent violent struggle began when Kashmiri Muslims, emboldened by the Afghan success in the fight against the Soviets, launched a similar movement against India in the late 1980’s. These mass protests attracted support from Indian civil society groups and attention from the international community. Kashmiri stakeholders, including militant groups, enthusiastically welcomed this renewed international interest in the resolution of the Kashmir conflict. Even Syed Salahudin, chief of Hizb ul Mujahideen (the Mujahideen Party), on behalf of the United Jihad Council — a group of several militant organizations — stated that Obama and Rice’s statements were encouraging in bringing about a resolution to the Kashmir conflict. While these non-violent demonstrations have attracted the world’s attention, given Obama’s recent acknowledgment of the conflict, words alone cannot help; concrete actions must be taken by the United States to facilitate lasting peace in the region. This entry was posted on June 16, 2009 at 8:02 am	and is filed under Articles & Editorials, Conflict of Kashmir, File Record, Freedom Movements, Jammu and Kashmir (I.O.K.). You can follow any responses to this entry through the RSS 2.0 feed. Both comments and pings are currently closed.